Sight. Touch. Smell. Taste. Hearing. These are the senses that create the human experience. These are the senses that we need to stimulate for optimal brain health. These are the senses that are so limited in today’s artificial, sterile and repetitive world of over stimulation. These are the final pieces to the puzzle of brain health. The key with brain stimulation is to get it just right. Think of Goldilocks and the three bears. Overstimulation = blow a fuse. Optimal Stimulation = just right. How do we get it just right? Get outside and stimulate your senses. We already have a plethora of technological and super stimuli surrounding us every day and this isn’t necessarily a bad thing. IF we mix in a good dose of the natural stuff. This could fall into making connections but I think it’s even more primal and foundational. Yes, our brains are just adapting to what we ask but that’s the problem. We are forcing an adaptation that doesn’t allow full capabilities and then we expect to have full capabilities. Sight – get outside and see what your eyes are missing. Sunlight, darkness, moonlight. Natural texture. Trees, grass, creatures. Other people. There is so much beyond our screens it can be eye opening, literally. Brain health and eye health are directly linked and without the depth of 3-D scenery the brain becomes very two dimensional. The beauty of natural scenery is its texture, variety and dynamic. Hardly a straight line to be seen. Colors, contrast, variety, depth!, movement, flow. Sound – listen to nature. Give your ears and brain a break from clicks, beeps and listening to shallow or oversounds. Listen to the purity of wind, creatures, trees, grass, birds, feet walking on the ground, running water, people’s voices, breathing and heartbeats. Sounds are so primal that without them the brain gets limited growth. The beauty of natural sound is its simplicity. Pure and direct. Touch – feel nature. Stop avoiding or putting a barrier between yourself and the world. Feel sunshine, hot, cold, wind, rain, the ground under your feet, the earth on your hands, other skin against your skin, food in your hands and in your mouth. Touch is one of our first senses and without it we cannot thrive. The beauty of natural feel is its intensity. If you’ve been disconnected from touch you’ll be amazed at the deep experience that natural touch can be. Smell – smell nature. Let yourself smell things. Flowers, rain, grass, dirt, animals, other people without perfumes, real food, animals. So many of us are afraid of smells and cover them up or sterilize them away. There are smells everywhere that are tremendously beneficial to our brains. The beauty of natural smells are their variety. So many versions of different smells and aromas. Taste – taste things. This gets lost often but is just as important as the other things. Taste things. Food, people, dirt, blood. There’s so much more variety of taste out there than we let ourselves experience. We eat from such a limited palate of foods (wheat, corn, soy, potatoes, chicken breasts, etc.) that are so commonly seasoned and prepared that we miss out on a tremendous amount of tastes and textures. Think of all the cuisines across the world. Explore taste for a tremendous brain boost. The beauty of natural taste is its earthiness. It connects us to the planet and primal existence. That’s it. Let the brain feed on sensory experience. The old fashioned kind. You will be amazed at what is out there if you let yourself experience it. 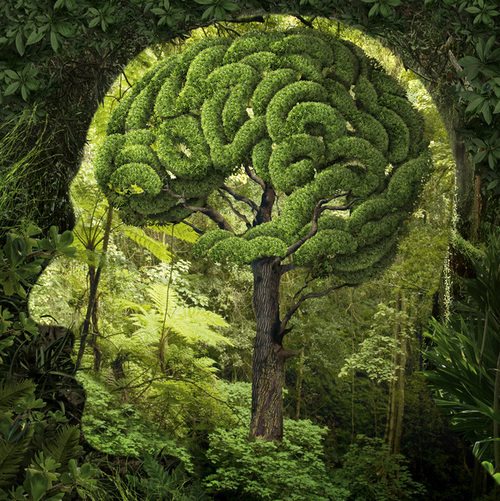 If you want to keep your brain health strong, let it reconnect to the natural world and all the information it shares with us each and every day. Here’s two quick videos I recorded a while back that give you just a sense of what I’m talking about. Even getting just the basic sights and sounds without all the depth is pretty cool. Experiencing this kind of stuff is what really counts.